Tulsa Bone & Joint Associates has two surgeons who are second-generation orthopedic surgeons for TBJ. Dr. Scott Dunitz and Dr. Jason Griffin are continuing the tradition of orthopedic excellence established by their fathers, Dr. Norman Dunitz and Dr. James Griffin. Tulsa Bone & Joint is proud to carry on the legacy of excellent patient care established by Dr. Norman Dunitz and Dr. James Griffin. Maybe someday we will even have a third generation of orthopedic surgeons to report! Top photo: Drs. Jason and James Griffin are pictured here enjoying their favorite hobby, flying. Bottom photo: Drs. 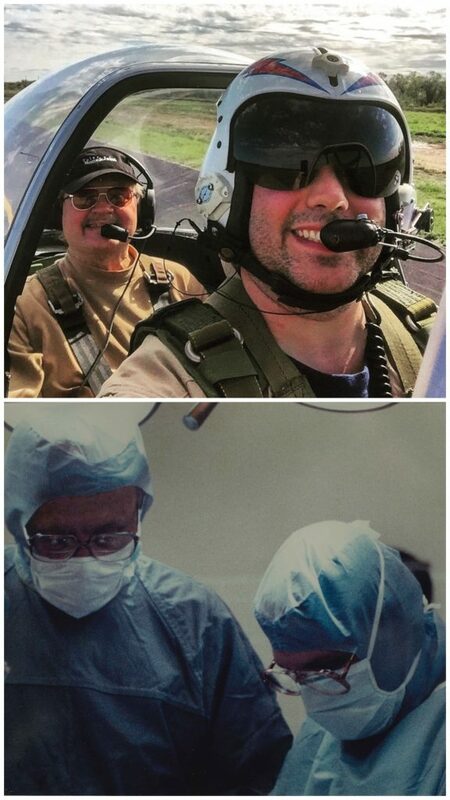 Scott and Norman Dunitz are pictured here performing surgery side-by-side.